Classy is my first thought. I want to design projects that would make a person want to pick them up just to look at them, while still delivering the appropriate message to the intended target. I really enjoyed designing this piece, and fortunately, it has turned into a series with a web banner and Facebook banner to come. 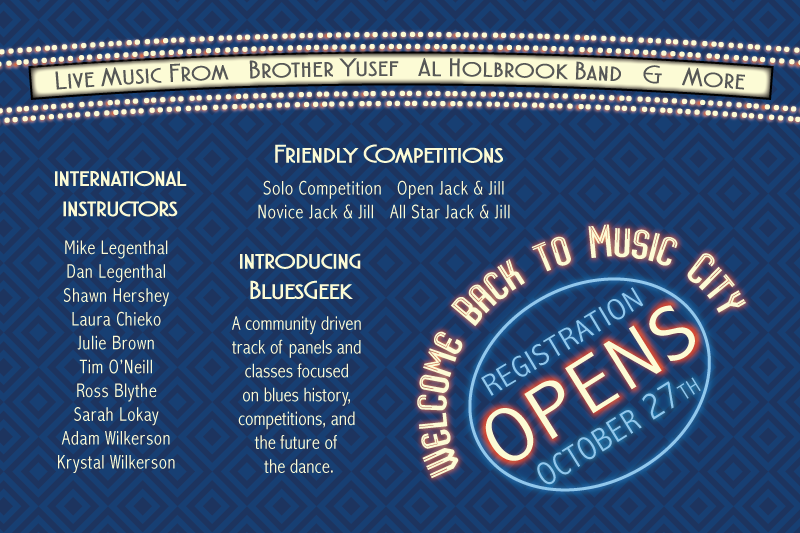 This postcard graphic design was created for a local dance event and inspired by the previous year’s design. It was turned around in 40 hours including the design consultation where the client provided very detailed needs. 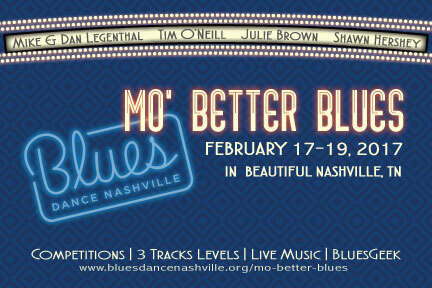 The only part of the previous year’s design that was copied was the headline font – Mo’ Better Blues – and diamond background, although we used a different diamond pattern. The plan is to keep these two elements consistent from year to year, using it as branding for the event. The marquis was a new idea applied this year to highlight the international instructors and tease the bands providing live music at the event. It provided me with a clean yet fun way to fill up much of the negative space on the front and back of the card. The “OPENS” sign was inspired by their logo (on the front) and worked well for announcing the registration date. It was an interesting mini-challenge to pull off the warp and blur PhotoShop effects within Adobe Illustrator. Though I am satisfied, overall, with the final piece, the back of the card was a challenge both to fill negative space and create a hierarchy with the different sized event information that was provided. If I had more time with the project, I would likely work on improving the readability and design of this side. I would focus on making sure typography was at its pique and all the different elements blended well together. Your ideas need to be treated seriously and at The Small Business Assistants we pride ourselves with making your ideas come to life. Whether it is a postcard graphic design project or a web design and development project, we want your marketing media to reflect the personality, values and mission of your business. If you would like a partner in the design and development field whom will work hard to be a part of your business, not just a contractor, contact us today.